This album had a massive impact on my teenage brain; it was often the soundtrack of many... voyages. "Bayreuth Return" is still one of those pieces that brings me right back to that time. In particular it was the space-age effects, the spitting, vibrating, helicoptering noises that sit right on top of Schulze's usual minor key backdrop, the quiet twisty sequencing and the almost minimalist soloing. It was really the first time I was faced with music that isn't so much about choruses and bridges but about the drone, the Om sound, something that seems to just sit there but is really being masterfully moved slowly forward even into climax. It was haunting, sad and ultimately eternal. And I probably played Side 1 five times for every spin of Side 2. Next in the Revisited reissue series after Blackdance is Timewind, Klaus’ fifth release, the one he considers his breakout album and the one that brought him worldwide success. Timewind is also the first release with clear references to Richard Wagner. The two tracks, “Bayreuth Return” and “Wahnfried 1883,” are classic Schulze home recordings. Klaus still had the bare minimum of equipment (organ, keyboards, and synths) and used his Revox 2-track tape machine for delays and echo. As such he had to record his music in one take. It wasn’t until Moondawn that Klaus had access to a 16-track machine. It is simply amazing what he was able to achieve with such primitive equipment and the music still sounds fresh today! For bonus material on the reissue, Klaus opted to include a second CD containing three pieces. “Echoes of Time” and “Solar Wind” are unreleased live variations of “Bayreuth Return” and thus fit well in this reissue. The third piece, “Windy Times,” was recorded in 2000 and is based on a sequence from the Timewind session and previously appeared on the promo CD for Contemporary Works 1. 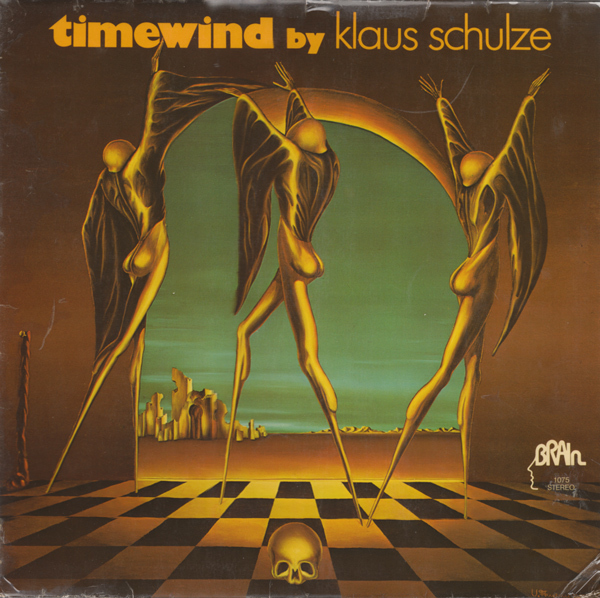 An interesting side note is that Klaus received the prestigious Grand Prix du Disque International for Timewind in March 1976, which resulted in every French public library, university, and school purchasing two to three copies for the their archives. Overnight there were orders for 20,000 – 30,000 copies of Timewind!